his botanical family is present with 33 members in our materia medica. It is probably the one family with the most homeopathic remedies after the Ranunculaceae (with 43 members). There is a surprisingly large number of plants in this family, which we use as foods or spice. Take carrots, parsley, pastinaca, celery, fennel. This is probably the family with the largest number of food plants and spices in homeopathy. Most of them we know from supermarket shelves but have little personal experience using them as remedies in homeopathy. Of course, we know the famous and big ones like, e.g., Cicuta and Conium. But the rest is just as valuable and "big." The only thing "small" about a small remedy is our knowledge about it. And after the seminar, I am ready to tackle a couple of small Umbelliferae cases as well – just let them come! To shed more light on this botanical group and feature also its lesser known members, Massimo Mangialavori devoted an entire seminar to the Umbelliferae. With his permission, I am going to present several cases and leave the final touches of identifying the simillimum to you as a quiz. (see links above left). 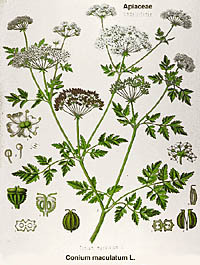 The family got its name from the umbel shaped flowering stand, which is common to all its members. Below right is a good illustration of Conium, which shows what I mean. Compare that to the illustration of Cicuta to the right, for example, and you see what is common to all family members. 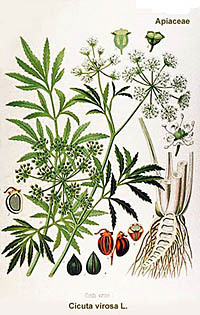 Below is a list of the Umbelliferae family as it presently exists in our materia medica.